Customer We installed an office air conditioning unit for Bromley-based web marketing agency Make Me Local. They specialise in local online marketing, working with customers in Bromley and Kent to design websites and shape their online marketing strategies. How did we meet the customer’s air conditioning requirements? 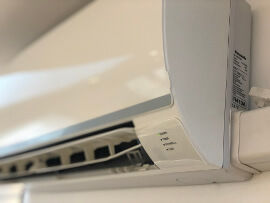 We selected and installed an appropriate wall-mounted air conditioning unit for an office environment, installing it to fit around the needs of the customer. The business owner was finding he was having to send staff home because it was too hot in the office, so he needed a quick solution. What did we do specifically to meet the customer’s needs? Worked flexibly. As this was a working office, we adjusted our hours to work around members of staff without interrupting their schedules. Installed the unit through the roof. There was not an external wall available, so we solved this problem by installing pipework through the roof. Brought in other contractors. We worked with roofing contractors to make sure the roof was watertight and we were drilling into the right parts of the roof. Braved the weather! There was an enormous storm whilst the installation took place – this didn’t stop our team, and we still completed our work on time. 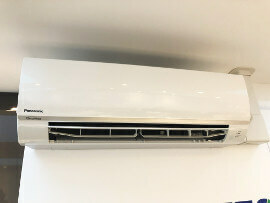 We installed a wall-mounted air conditioning unit from Panasonic, as it most closely met the customer’s needs. We secured a good price for it, and the unit comes with a 7-year warranty. We will also be carrying out regular servicing for the unit, completing an annual service. What did the customer have to say about our air conditioning installation? “The guys were so polite and a pleasure to be around. The system is perfect, if you are working in an environment where it gets either too hot or too cold, I recommend these guys for sure. If you are interested in commercial air conditioning, speak to a professional installer who can help and advise. If you would like us to carry out a survey, please just let us know. 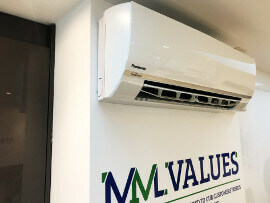 We will make sure we install the right unit to cool and heat your space. 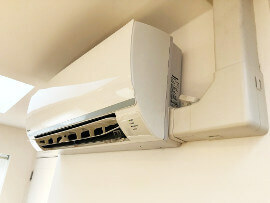 You should also choose an air conditioning servicing contract to keep your new unit in good condition. This will keep it working to its optimum level and will prevent any issues occurring in future. Want to ask us a question about air conditioning in Bromley? We help many customers just like you, meeting their requirements in full every time. or send us a message online to request your free quotation.